Missing teeth can hinder a person when they meet new people or have to attend social outings, as it negatively impacts their confidence. That is why Ireland Park Dentistry provides dental implants, a comprehensive solution to missing teeth. Implant treatment allows patients to regain optimal oral health and aesthetics. With over 100 hours of training in placing and restoring dental implants, Dr. Sridhar Meda is able to help patients achieve their dental goals while exceeding their expectations. Searching for a capable team able to restore the beauty and health of your smile? Look no further than our South Bend dental practice! 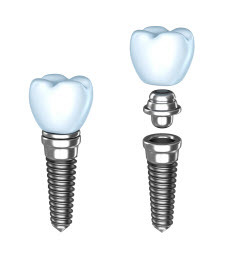 Dental implants consist of three components: post, abutment, and restoration. The implant post is what Dr. Meda strategically places into the jawbone, to provide your prosthetic with strong support. A common side effect of missing teeth, especially if left unaddressed for an extended period of time, is that the jaw begins to atrophy at an accelerated rate. This is due to the loss of the teeth roots which maintain the surrounding supporting structures. Dental implants replace missing teeth roots, meaning the jaw does not undergo the resorption process. Missing teeth can also cause crowding or crooked teeth as neighboring dental structures begin to shift into the empty space left behind. By replacing the tooth, you preserve the alignment of your smile. Obtaining dental implants is a step by step process, and is typically made up of four segments: the initial consultation, the placement procedure, the healing period, and the restoration. During your first appointment, Dr. Meda examines your dental anatomy to make sure your smile’s condition meets up with the necessary requirements. In order to be an eligible candidate for implant treatment, you must have adequate jawbone mass, no signs of decay or infection, and healthy surrounding gum tissue. If it is determined that you do not meet these prerequisites, you must receive additional treatment before the placement of your implants. If you find yourself in need of a bone graft, Dr. Meda does perform some of them in our office for your convenience. After making sure that your oral health meets the requirements, our dentist takes digital images of your dental anatomy. This helps him determine the best location for the placement of your dental implants. Dr. Meda also uses the latest technology of 3D cone beam imaging at the office that helps in planning and placing the dental implants safely. After your initial consultation and treatment plan have been completed, you will return to our South Bend dental practice to undergo the placement procedure. To ensure your surgery is pain-free and comfortable, our dentist thoroughly numbs the area and can also provide nitrous oxide. Once the procedure is complete, you must wait the appropriate amount of time for surrounding tissues to heal. Then when you come back to our dental practice, you receive your permanent restoration, crafted from aesthetically pleasing materials. For complex cases, our dentist refers you to a trusted specialist to receive the care you deserve. If you wish to achieve a beautiful, complete, and healthy smile, contact Ireland Park Dentistry today! Our South Bend dental team is dedicated to the well-being of your smile and making sure you feel confident when you leave our practice.